Eleven interesting candidates were found utilizing a modified GARP screen with finbox.io's screener, which focused on the Forward PEG (between 0 and 1), required positive free cash flow, a Short Interest ratio under 3 (the NYSE's Short Interest ratio is 3.6), and both analyst and quant model upside of 15% plus. YY Inc. is a Chinese live streaming platform that has gained nearly 100% over the last year. It's largest holders are emerging market funds, and it skews more towards aggressive growth. The stock has solid metrics and warrants further research, but it does not fit the GARP profile. 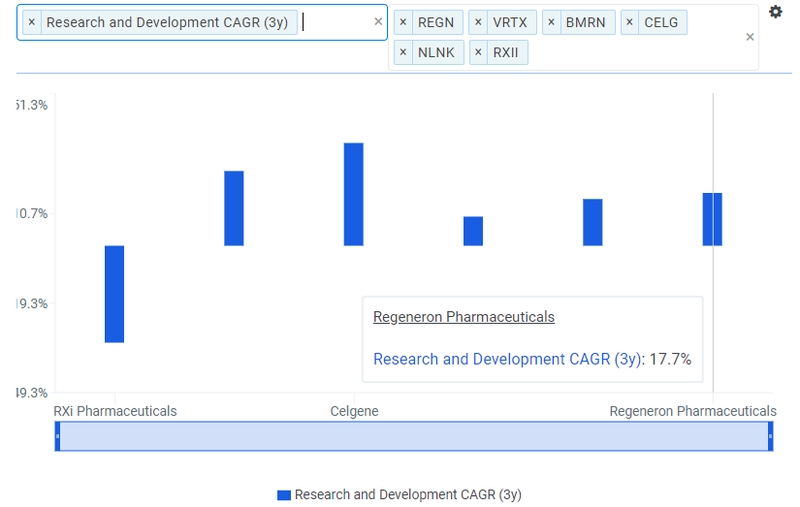 Regeneron is part of the Biotech industry, which in the past would also be considered more growthy, but the biotech large caps have matured. The biotech's growth has been on the strength of Eylea, a drug to help with macular degeneration in the elderly. Regeneron continues to expand the allowed usages of the drug, such as to diabetes-related damage. The knock on the drug company has been its portfolio. As is obvious below, Eyelea makes up an outsized portion of sales for the firm. More good news for the existing portfolio comes thanks to the behind-the-scenes machinations of drug prescriptions. Pharmacy Benefit Managers ("PBM's") are the gatekeepers for drug dispensing for health insurers. These are essentially group purchasing organizations, who pool the insured from multiple health insurers to negotiate better fees with both drug makers and pharmacies. Express Scripts Holding Co (Nasdaq: ESRX) is the largest, managing 25 million patients. Until a recent deal to exclusively offer Regeneron's Praluent, an expensive cholesterol drug, the PBM was rejecting 70% of prescriptions for it and a similar drug offered by Amgen. The company expects sales to quickly jump as a result. On a side note, both Express Scripts and its next largest competitor CVS Health Corp (NYSE: CVS) are pending approval to merge with health insurers CIGNA Corporation (NYSE: CI) and Aetna Inc (NYSE: AET), respectively. A drug company's pipeline is often the biggest known unknown. Regeneron has 16 drugs in clinical stage covering cancer, diabetic eye diseases, pain, muscle atrophy, and allergies. It is expecting approval of Dupilumab (asthma) and Cemiplimab (skin/lung/spine cancer) in 2018. Argus analyst Jasper Hellweg expects Cemiplimab to be one of a couple of blockbuster drugs that will launch from the pipeline over the next few years. 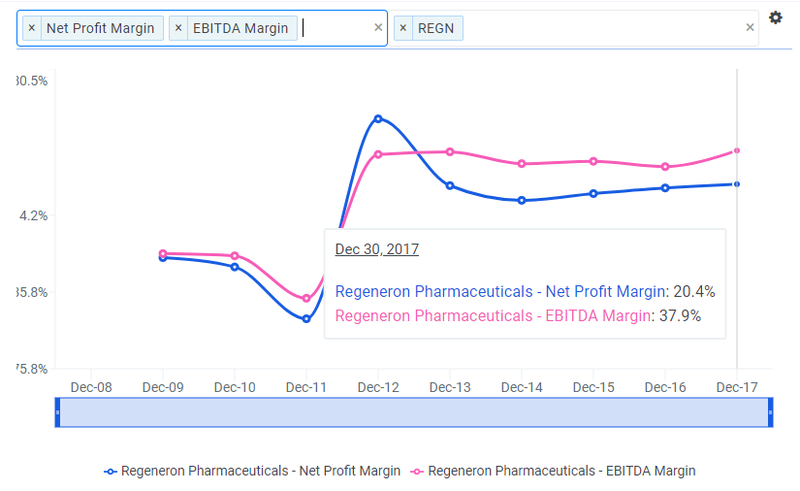 Regeneron has the second best Net Profit Margin of its peer group, behind Celgene Corporation (Nasdaq: CELG). Its margins have remained stable over the last four years with a slight upward trend. Regeneron has added debt in the last year, pushing total debt to $703 million. However, as shown below, it has 2x more cash on hand than debt. It also has nearly 2x cash flow as debt. The firm's Debt/Equity ratio is towards the bottom of its peers at 11.4%. Management appears to be executing well compared to its peers. It sweeps finbox.io's Profit Benchmarks and shows how it differs from its peers by actually having positive returns. Its collaboration agreements on drug development and sales mean that it shares the profits and losses. This helps level out the highs and lows for the company. The Return on Invested Capital ("ROIC") and ROE are particularly impressive. The firm reports earnings on May 3. Its three earnings beats in a row indicate that it has been able to manage expectations. Recommendations have slightly improved with zero sells and 13 accumulates tempered by 13 holds. For the year, analysts are forecasting 12.9% bottom-line growth followed by 13.5% in 2019. Drug trials and approvals are fairly transparent, so analysts will be watching for the uptake of Regeneron's newer launches and trajectory of its workhorse Eylea. 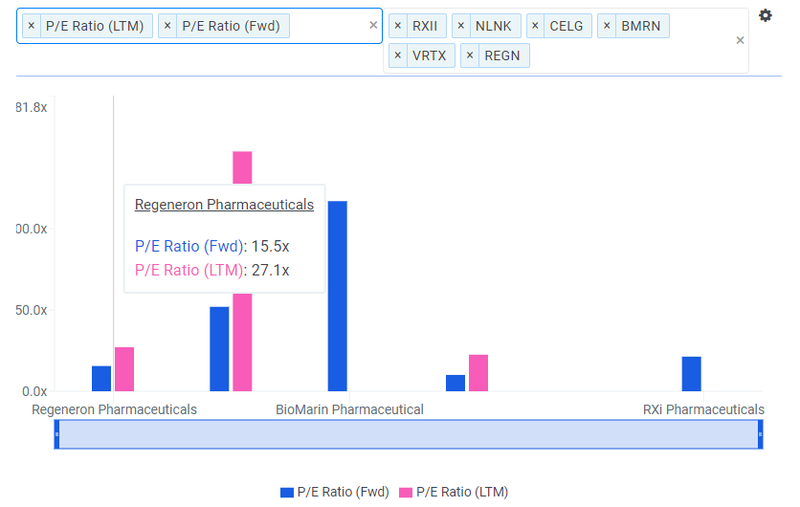 Regeneron's trailing and forward P/E's show it a bit undervalued compared to its peers. 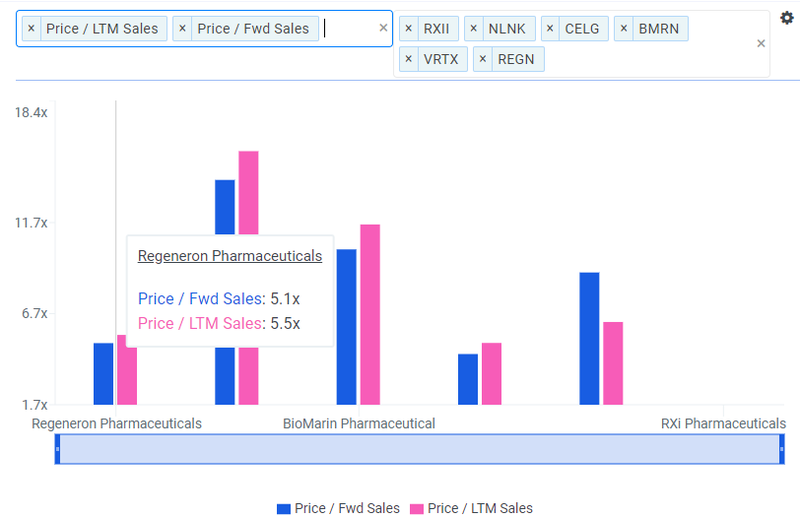 Only Vertex Pharmaceuticals Incorporated (Nasdaq: VRTX, highest P/E's) and Celgene (lowest) have positive EPS on both measures, and can, therefore, be charted. The last multiple is even tougher for biotech companies - it requires free cash flow - meaning cash left over for investors. 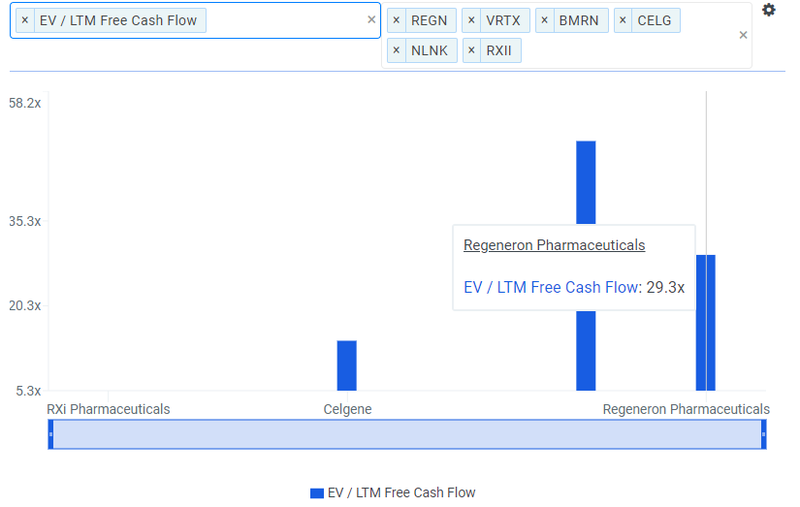 Only two of its five peers generate FCF, and assuming the other companies have infinite Enterprise Value/FCF multiples, Regeneron again falls on the undervalued side. 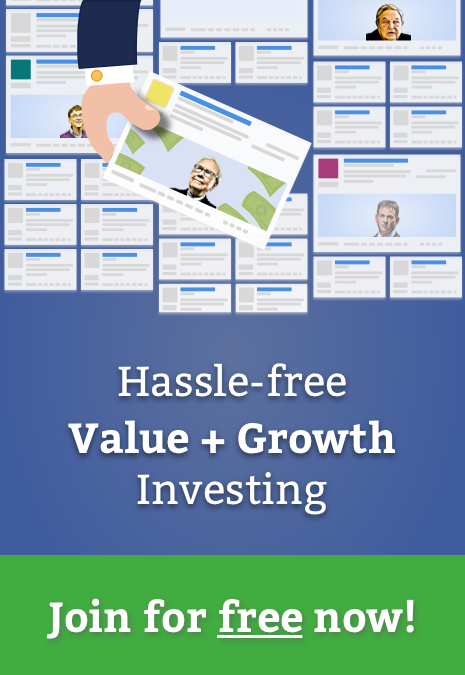 Wall Street targets and finbox.io's Fair Value confirm the prescription for appreciation. Wall Street expects the stock to gain 40.6% based on 21 analysts, and finbox.io's composite valuation model points to 33.2%. While Celgene met the short interest ratio, Forward PEG, and most other screen requirements, it was filtered out of the GARP candidate list because the quant models and Wall Street were not in sync. Analysts see 33.1% upside, while finbox.io's quant model is only at 7.9% with high uncertainty. Regeneron's stock price fall over the last 10 months is not supported by the numbers. With a broadening portfolio of drugs on the market and a few aces up their sleeve in the pipeline, the company is set to prove to investors that it is not a one-trick pony. Its deal with Express Scripts, broadening of Eylena's uses, and international approvals of Dupixent should help the bottom-line sooner than later. Management has a track record of delivering steady top and bottom-line growth and industry-leading margins. ROE and ROIC metrics also confirm the executive team is firing on all cylinders. 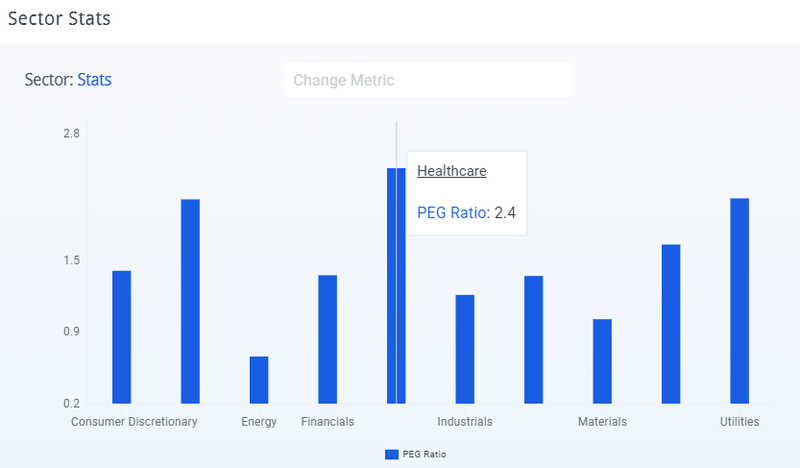 With the Fed holding off on raising rates and calming fears for a knee-jerk reaction to inflation, the market may be a little more hospitable to Regeneron. Sales and earnings-price multiples, along with EV/FCF, indicate the stock is undervalued relative to its competitors. 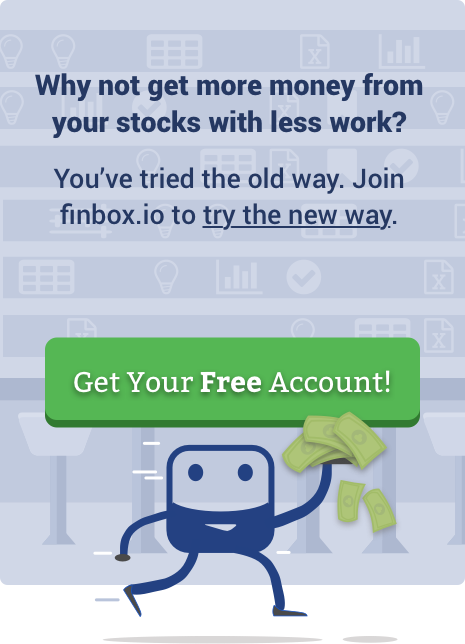 Wall Street and finbox.io's quant model also point to upside potential. 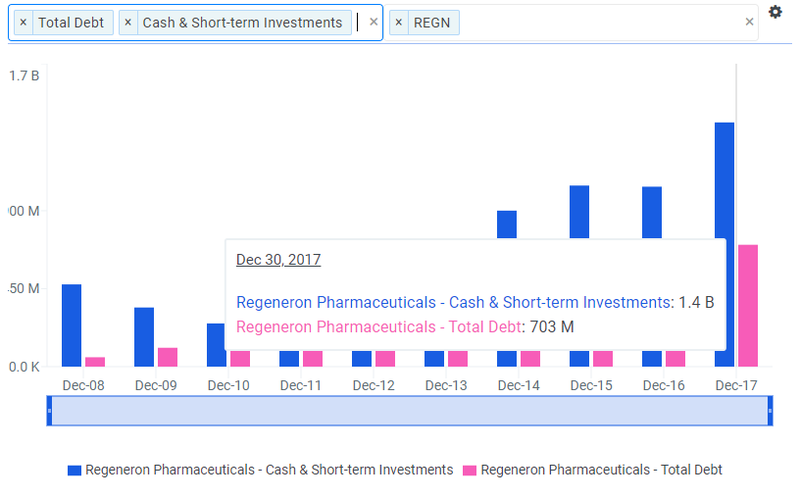 Regeneron's price trend may be a bitter pill to swallow, but the stock's intrinsic value looks to be good medicine.